I have been a teacher for 27 years, a Headteacher for 12 years and, at the age of 51, this much I know about doing maths GCSE questions. This begins a short series of activities about teaching students how to develop their metacognitive skills derived from a training session I delivered recently for colleagues. My simple argument is that we need to model explicitly the mental processes which we, as teachers, can often take for granted. Flavell (1976), who first used the term, offers the following helpful example of metacognition: I am engaging in Metacognition if I notice that I am having more trouble learning A than B; if it strikes me that I should double check C before accepting it as fact (p. 232). I teach students how to use the checklist by modelling aloud the process as I complete a GCSE question whilst using a visualiser and insisting that they write down exactly what I write down at precisely the same time. The process is explained extensively in a previous post where Lisa Kirby and Kallan, one of our students, can be seen talking through the five point checklist as they each complete an answer. 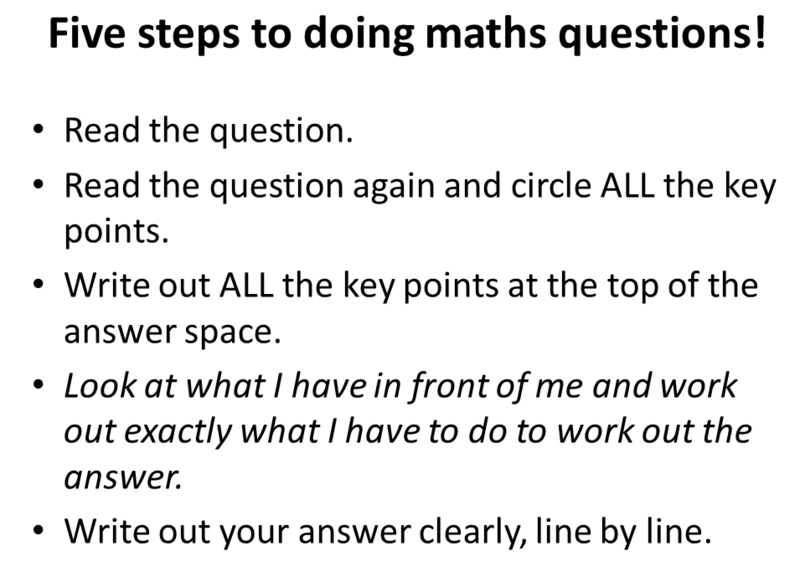 I feel that the fourth bullet is the most important, that moment when you have all the elements of the problem laid out in front of you and you then have to reflect upon which bits of your maths knowledge bank you need to employ and connect up in order to answer the question. The checklist is almost so obvious that many a teacher will dismiss it as unnecessary. It is easy to glance at the checklist and exclaim, Don’t be silly, of course they know that is what they need to do. I would argue, however, that not many of us have explicitly ingrained the process into our students’ brains so that following the checklist is an automatic response for them. Students have not the time, nor the space in their short term memories, to think about what basic process to follow when they approach a GCSE maths question in the examination hall. Students I have worked with have come to value the checklist. It has helped automate a basic thought process, giving students the confidence under exam conditions to know how to do maths questions, and when they get the to the difficult end of the exam paper, to know what to do when they don’t know what to do. Absolutely agree John. Here is the link which I will share with my students tomorrow Period 1. Circle Theorems. Lesson delivered via visualiser and sharing thought processes and instructional in method. The videos are proving useful for students to recap on work. I’m sure their are hundreds more via YouTube.